Although there will be the usual 3 winners, we are looking for more than just 3 maps. As well as this there is no limit on how many you can submit, just so long as they follow all the rules. As usual, use /submit in Creative to submit a build. All sides of your map must have walls so you can't see out of the map, these can look however you want, such as flat walls, hills, decorated walls, etc. Your map must have some sort of theme, this could be things like The End, a City, The moon, or whatever else you feel like. The should be 1 of 4 difficulties, Easy, Medium, Hard or Impossible. This means if you want to make a hard map, don't have too many easy jumps, and vice versa. This just means no mazes or puzzles. These rules are not extremely strict, if you don't want a single theme or want a small maze in your map go for it, just keep in mind that it will affect the way it's judged. 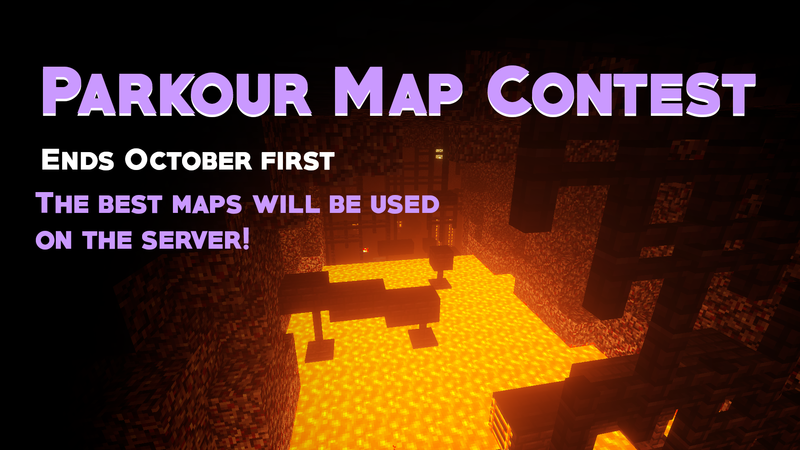 As said before though, even if you don't make the top 3 you still have a chance of getting your map added to the parkour lobby! We're not expecting a lot of entries, but if you want to participate this is a great opportunity to have your build added to the server. Finally, I'd just like to congratulate StoneishDuckachu on winning the Summer Resort contest, they've been awarded with 1000 notes.